We use it to make Delta Starch Fufu which I will explain how to make on this page. Delta Starch goes well with Banga Soup and Owho Soup. Starch is used as the binder in Spring Rolls Wrappers dough. 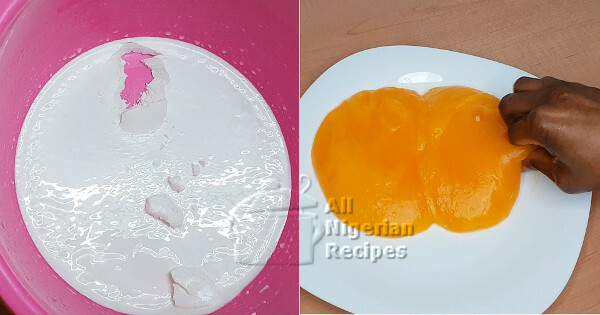 You will often see starch sold side by side with Akamu/Ogi in Nigerian markets. On this page, I'll explain how to extract cassava starch if you cannot buy it where you live. I will also explain how to turn the extracted starch into the popular yellow Delta Starch Swallow. The quantity of cassava tubers you need depends on the quantity of starch you want to make. Raw starch stores well in the freezer so you can make large quantities and store. It is much better to watch the process in the video below so click here to watch. Cut into small pieces or grate. Separate the chaff from the cassava blend using the chiffon cloth. Rinse with clean water as you sieve till all the starch has been washed off the chaff. The chaff that did not pass through the chiffon cloth is Cassava Fufu. Click here for how to turn it into a swallow meal. Leave the starch in the bowl for at least 3 hours so that it will settle at the bottom of the bowl. When settled, clear water will be seen at the top while the starch will be at the bottom of the bowl. Slowly decant the clear water then scrape the starch into a container and store in the fridge or freezer. Scale up or down to match the quantity of starch you are making. Add enough palm oil to turn the starch yellow when done. For 1 cup of starch, I would use 3 tablespoons red palm oil. From experience, you will know the quantity you prefer. Mix everything very well till you get a smooth mixture, no lumps. Set on the stove, turn on the heat to medium and start stirring continuously. As the starch heats up, it solidifies. Keep stirring nonstop till a solid yellow mass is formed. There should be no streaks of palm oil. The starch should be yellow all over. Take it off the stove and serve immediately. Serve Starch to any Delta person with Banga Soup or Owho Soup. They will love you for that!